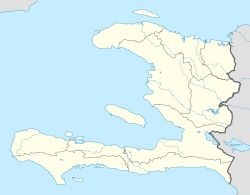 Port-au-Prince (/[unsupported input]ˌpɔːrtoʊˈprɪns/; French pronunciation: ​[pɔʁopʁɛ̃s]; Haitian Creole: Pòtoprens; Haitian Creole pronunciation: [pɔtopɣɛ̃s]) is the caipital an lairgest ceety o the Caribbean kintra o Haiti. The ceety's population wis 704,776 as o the 2003 census, an wis offeecially estimatit tae hae reached 897,859 in 2009. The ceety o Port-au-Prince is on the Guwf o Gonâve: the bay on which the ceety lees, which acts as a natural harbor, haes sustained economic activity syne the ceevilizations o the Arawaks. It wis first incorporatit unner the colonial rule o the French, in 1749, an haes been Haiti's lairgest metropolis syne then. The ceety's layoot is similar tae that of an amphitheatre; commercial destricts are near the watter, while residential neebourheids are locatit on the hills abuin. Its population is difficult tae ascertain due tae the rapid growt o slums in the hillsides abuin the ceety; housomeivver, recent estimates place the metropolitan aurie's population at aroond 3.7 million, nearly hauf o the kintra's naitional population. Port-au-Prince wis catastrophically affectit bi an earthquake on 12 Januar 2010, wi lairge numbers o structures damagit or destroyed. Haiti's government haes estimatit the daith toll at 230,000 an says mair bodies remain uncoontit. ↑ "Sister City International Listings". Sister Cities International. Retrieved February 2, 2010. Wikimedia Commons haes media relatit tae Port-au-Prince.